So...you wish to know why I do what I do; where did I start? How could one be this huntsman who does what might as well be the job of solders whenever he can? Well...it's kind of a straight forward story. One with so few memorable details and yet...I remember them. 3rd year at Beacon. Three years ago. A quiet, Spring, Saturday morning. The sky was clear. It was a peaceful day, and one many students have looked forward to all week as a day of rest. Inside of this one coffee shop sat those that are already up for the day, wanting either breakfast or a pick-me-up cup of coffee. The coffee tasted bitter that day. Raven walks into the little cafe not even a murmur among the customers sitting there. Not wishing to attract too much attention to himself, he takes a seat in the back corner and waits for someone to take his order. A couple minutes later, "Just a coffee, please.." The words are soft but clear. only another minute and Raven has a coffee in front of him. He takes two sugars and a cream and puts them in, gently mixing them. Light from the window next to Raven illuminates the table in front of him and a little of him. Light from the newly-risen sun. "I'm telling you Big Brother, coffee isn't that bad! Come on!" Eclair dragged Genesis into the shop in order to try out coffee on that morning, there wasn't much happening on that day, another episode of de va ju. Genesis at that time still considered coffee to be some sort of drug, it was his first time taking it though normally he wouldn't do so he was convinced otherwise. "Alright just this once, after that I am not taking it again." Eclair smiled deviously as she ordered two cups of coffee snickering as she glanced behind. "You better keep your word Genny." "I can call you whatever I want!" "Oh fine then, just give me the damn coffee and get this over with, we still have to head to signal." With that the coffee arrived and were served. Eclair took a sip and watched her step brother closely. The moment was comically intense as Genesis noticed her watching him in anticipation. It was creepy and it took only a few short moment to ignore her stare and took a small sip. He liked it. "This coffee is good but I am not drinking this anytime soon." a large man had been sitting at one of the coffee shop tables in the center of the store, he was also having a coffee like many others there, but he was also there for something more. The cafe staff seemed a bit on edge due to the man's presence as well. A young blonde girl cheerfully moved to the table that the large man was sitting at, her smile seemed to easily cut through the dark aura that was coming from him as she asked, "what can I get you sir?" the man chuckled a bit at her question as he glanced over at the twelve year old. "your a little young to be working here, do you know who I am little miss?" Aria stared intently at the man for a moment trying to figure out what he meant by that. "hmmmm....your......a valued customer?...." "WRONG! I AM ABOVE A MERE CUSTOMER!" "eep!" Aria jumped and stood at attention as the customer lashed out at her. "I am Ronald McEatems, a food critique that evaluates dumps like this all over the city. My word makes or breaks five star restaurant and cafe's alike! KEH HE HEH!" Ronald paused for a moment to take in a fair amount of enjoyment from of seeing the terrified look on the cafe staffs faces. "you asked me what you can get me, little miss? Bring me whatever you think is good enough to bet this cafe's reputation!" Aria's seemed thoroughly annoyed at the portly man's demanding request, her hands had already crushed the pen and paper that she brought to take his order out of sheer frustration. "right away.....sir.."
Aria moved back around the counter and towards the kitchen. The cooks were frantically asking her what the critique might want, but the blonde haired girl ignored their cries and simply pushed them out of the way. the store manager marched into the kitchen as she was gathering a few things and bellowed "Aria! What are you doing!? What did Ronald McEatems want!?" "He wants something good to eat....I thought that his words might taste pretty good after that finely prepared monologue." "huh?" "just watch mister, I am adding something new to the menu!" she plucked her sword out of a cabinet and placed that, along with the ingredients she needed on a neat cart with an oven top on the side. "what is all this?" said Ronald the criique. "do you think a fancy show will save you little miss?" as he finished speaking, a flash of silver erupted from Aria's sheath as she drew the blade and held the tip mere inches in front of Ronalds face. "GHK! a-are you forgetting...wh-who I am! Aria couldn't help but giggle as she watched Ronald try to puff up and look big in the presence of her blade. "right now, your just a stray off the street that has come begging at our house for scraps! So sit there, quietly, like a good boy, and let me get you something good to eat." the stove was red hot, with a cast iron skillet on top that was begging to cook her ingredients. Aria took several eggs and tossed them into the air as the threads from her sword wrapped themselves comfortably around her fingers. Another flash of steel ran through the eggs as she cut them cleanly in half and let the yolks spill onto the skillet. She used the sheath of her blade to catch the egg shells before they could hit the pan, then tossed them across the room into the garbage can. in a little time, the eggs had been made into an omelette, but it wasn't over just yet. "Now the veggies!" the young cook flipped the omelette high towards the ceiling with the pan, and at the same time, tossed the plate of veggies up as well. as the vegetables descended towards the pan, her sword began moving again, back and forth through the vegetables it went, cleanly dicing and slicing them until the hit the heated cast iron surface. The omelette landed on top of a bed of diced and potatoes, onions, peppers, and was then seasoned and cooked a bit longer before making it's way onto Ronald's plate with a fresh cup of coffee on the side. "sorry for the wait, sir, I hope you enjoy your meal" Ronald took a sip of the coffee, still seeming a bit unnerved by Aria's swordplay, but also seeming to be looking forward to seeing if what she had prepared was any good or not. "the coffee is good today, little miss, I hope my meal won't disappoint me!" Aria sheathed her blade and gave a friendly smile. He began to eat, keeping a very stern face as he did. "this skillet.... he paused for a moment as he gathered his thoughts, and then began to shed tears of happiness. "THIS SKILLET IS THE BEST SKILLET DINNER I'VE EVER HAD!" The blonde haired girl let out a sigh of relief as Ronald cried out in approaval, and began to push the cart back into the kitchen so she could keep working her shift. "my goodness, people in this city are just plain crazy...."
By the third exclamation of rudeness to the little girl, Raven is ready to stand and let the man know exactly where he is, and what position he's in, but the girl starts to create a display of talent and Raven figures it would be best to let it be. He takes another sip of cof-"THIS SKILLET IS THE BEST SKILLET DINNER I'VE EVER HAD!" Raven immediately gets thrown into a coughing fit as some of the hot liquid enters his lungs. His first thought is to go over there but the attention to him immediately makes his personality shrink back down to its original size of being insecure and he slowly pulls his bandanna back up. One of those that just make you wonder what went wrong with them. Joesph Tanner: You could call him a 'man of many words.' Short, scrawny, little guy. Never shut up about anything, including their involvements with shady activities. It becomes his downfall nearly a year after this moment in time. The only reason why he's kept with the two others is the fact that he's both of their childhood friends and an ace driver. Gary Gelb: The polar opposite of Tanner. Speaks softly; carries a big stick. Known for his unhindered ability to kill and being just as good at not thinking about it afterward. He's still at large to this day and authorities currently have not a single lead onto his whereabouts. I fear that he may be waiting for me to have my back turned one day. For me to...slip up once. The familiar sound of a semi-automatic pistol cocking interrupts the restored peacefulness and before anyone has time to react, the barrel of a gun is pointed at Raven, and Aria. 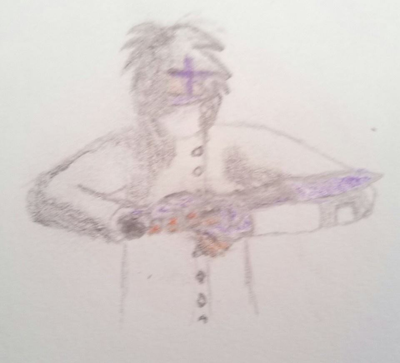 (If Genesis has more than Raindrop on him, he has the gun of Tanner pointed at him too.) Raven has the ornate .45 of Gelb's pointed at him while Black points his 9mm at the girl who obviously has a sword with wicked powers. Tanner packs a 9mm machine pistol-personal defense weapon. While Black stares at the girl, ready to fire at the slightest threatening flinch, he greets everyone. "Excuse me, everyone. My associates, and myself here would like to conduct an experiment and we would like you all to be a part of it." "Move, you die." Raven eyes Gelb, ignoring the gun pointed at him. He's had enough of the influencial picking on those who can't do anything about it for the day. Somebody make this guy take his eyes off me for a second so I may bash him over the head with a half-filled coffee cup. Yeah, point a gun at me, sure. "Now, as you may have noticed...places, like the one we're in...don't get stolen from very often so we'd like to see how this goes...For starters!..I would like everyone with any kind of weapon or currency, as well as any valuables like jewelry, to be placed on the table in fron' o' y'all..so that myself and my men can safely move them somewhere else. Where they are moved is dependent on what we find." Gelb gestures with the barrel of his gun toward the table Raven sits at, suggesting my weapons get taken off immediately. Hesitant, Raven starts to slowly stand with his hands raised and turn his right side to Gelb. He then slowly reaches down and grabs the grip of Faire Taire. The carbine is removed from the back of Raven's thigh and it changes to its combat form while he goes to set it on the table. The display of the weapon's transformation causes Black to look away from the little girl and over to Raven and Tanner to make a quick glance over before returning to his weapon's aim. "What. Is. That?.." Days always have to pass with a particular incident, this was no different. Éclair dragged Genesis to try out a cup of coffee and to his surprise it was delicious, to him a feeling of being alive comes but to us it’s just probably caffeine rush. They sat on the table by the corner of the café as the both of them enjoyed their coffee. They are to wait for a few more hours before their next mission starts. As young as they are, they were the children of a mercenary who took in government jobs and answer requests that the police wouldn’t do, you could say they were city hunters in training but that doesn’t mean their assignments are soley based on that. They handle all kinds of jobs, from urban crimes, hunting missions, infiltration, information gathering, combat effectiveness, they have been doing this ever since Genesis was 14 and Éclair was just 12 years old. After two years they have gotten used to this activity and finally they became working mercenaries, on the physical surface they are average children tending to school but under the hood they are working as adults. Their assignment was to investigate Signal at a specific time, though there was no need for rush. The common muttering of customers were put to a halt when suddenly a customer had shown up, claiming that he was a food critic. It was quite a commotion too hard to even ignore, the young blond who serve his order sure was something, quite forward and says whatever she has on her mind. Indeed they were crazy, speak of the devil a gun popped yet nobody died. Warning shots then notified to all people who had heard it that men are armed and ready to shoot whoever fails to answer their demands. Genesis looks over at Éclair as he finished his coffee. The only thing that Éclair and Genesis had with them is an umbrella. IF by any chance any of the three would shoot, the bullets will miss their targets. It was almost time to act, their escape vehicle is probably outside and it would be quite taxing to catch up with them if they try to escape now. The man who had surrendered his weapon was of course no mistaken a hunter by right. There was a reason he did surrendered his weapon, it was more likely an opportunity for the Blondie to take action as it was displayed from her early skirmish with the critic. the hair on the back of Aria's neck felt like it was standing up as the sound of weapons being loaded hit her ears. "you've got to be kidding me...." she turned in place quickly to see a gun held in place towards her. "it's just one after another with people around this city." she huffed and held up her hands up a bit as Black began to voice his commands. Though to be honest, how this crew was going about things was a bit strange to Aria. This was of course the first hold up she had ever had the pleasure of taking part in, but were the criminals always supposed to seem like they were beta testing a new game? Regardless, this "Black" guy seemed pretty meta, politely ask the customers to stand aside while they take the money out of the register seemed to be the general idea they were going for, or so she thought at least. It was when Black demanded that she set her weapon on the table so that he could take it from her that her blood began to boil. The blade she was carrying was invaluable to her, it's worth was nothing less than her life, and this man had the gall to ask her to give it away like it was nothing. Her green eyes were angrily burning a hole in Black's face by the end of his instruction, but because of his request, the other customer across the room laid his weapon on the table in front of him, transforming as he did. in that moment, Black's eyes were taken away from the child to check on the commotion made by Raven's weapon. Not enough time to close that distance from here the young girl thought as she quickly grabbed the hilt of the weapon, the threads once again tying themselves around her fingers as she drew the blade out from it's sheath and proceeded to throw it at Black guess I'll wing it! After the blade was airborne and spinning wildly towards Black, Aria immediately ran towards a table in front of her, hoping that she could flip it over before the entire gang could fill her with led, and if she was lucky, the table wouldn't just fall apart on her after taking bullets. Tanner immediately turns toward the girl and raises the folded-out stock to his shoulder. While Tanner does so, Black just barely dodges the attack, ducking to his left and the blade slashes his jacket's right sleeve. The blade gets stuck in the wall right in front of a man's face. When Gelb lowers his gun a little and turns his head to look at the commotion, Raven holds onto his gun. He lashes forward, puts his left arm over and around Gelb's open gun arm, and pulls it forward into Raven's back. He then kicks his shin into Gelb's calf so he starts to fall back, giving Raven room to shoot at Black and Tanner one-handed. Three shots go off, aiming at Black's weapon-hand and Tanner's weapon itself, all three miss but cause Black to hesitate from the suppression fire and Tanner to stumble in his aim a little. Just when Gelb regains his balance, Raven slams the top of the carbine right into the bridge of his nose. Gelb hits the ground and, before he can recover and point his hand gun at his attacker, Raven steps on his arm and kicks the gun away before backing up and pointing Faire Taire at Gelb. What those guys didn't know, is I was taught by my cousin, an active-duty marine at that time-reserve now-, on how to fight close range. That was actually my first time using it on someone in a real situation, instead of practice, so that probably left him pretty sore all over. Genesis nods to Éclair as does she nodded back, they both know what must be done from this point, Éclair quickly headed outside through the door as Genesis starts making his move, stunned by Raven’s attack, Genesis made the effort to kick Black off in order to distance him from the sword stabbed in the wall as he grabbed it and threw it back to the blonde’s possession. “Nice throw.” Gelb’s gun which was kicked off was blown by the air further away from him only to fall into Genesis’s possession. With his semblance active he aims down in an attempt to shoot off Black and Tanner’s weapons, disarming them. The next instance is going to decide everything in this situation. Meanwhile Éclair heads out to a motorcycle parked around the corner of the street in an attempt to call the police via radio. She was holding the Umbrella in her hand just in case, shifting the radio frequency she manages to tap into the right channel. Aria peeked out from behind the table after she began to hear the sounds of the struggle in the cafe. All the criminals were in combat with other customers with advanced skills, the place was a battle royal now. "guess this is why no one ever robs the local cafes" She giggled to herself a bit and moved out from the cover of the table now that the guns were off of her. Her eyes lit up as she saw her blade was now airborne again and flying towards her. "N-Needle?" she caught Needle and clutched it affectionately for a moment. "Needle you came back! Your such a good weapon!" Aria's mind shifted to Black once again after she was done fawning over the return of her sword. There had been a good amount done to take him out of the game for a precious few seconds, and because of that, the people fighting against Black's crew now had a chance. Aria crossed the distance between herself and the chain wearing criminal quickly, her left arms drawing the white sheath across her chest and switching the hold she had on it to a standard grip as opposed to her usual reverse grip, she did this so that she could draw her hand back across after she neared black, and violently bludgeon Black's weapon hand with her sheath. The motion with her left hand was more of a distraction than anything though, the goal being that even if her strike didn't land, he'd have to move the site of his gun away from Aria to avoid it. This created more than enough opportunity for the tip of her blade to make it's way through towards Black's throat, stopping mere inches from it. "trying to skip out on a bill is bad karma y'know, the only way to fix that is tipping your waitress well, and giving yourself up quietly of course." The young girl had her eyes transfixed on Black, waiting for him to give her any reason to shove her sword into his throat. Black maneuvers his nine around the attack and points it back at the girl, leaving them at a stalemate. "Hm. It seems whoever gets out of this depends on how it all plays out, huh?" Black smiles an entertained grin. Tanner was already on the boy with Gelb's .45. Right after Genesis pulls the trigger to disarm Black, Tanner lets a burst on his weapon. One hits the gun right on the right side of the barrel's tip, one hits Genesis where his right arm meets his chest, and the third is carried by the recoil of the other two shots and just misses up and to the right of Genesis's arm. Everyone's ears ring from the piercing noises. The shot that disarmed Black should have taken him out of the game, leaving Raven to neutralize Tanner as a threat, but that is not what happened. The shot connected flawlessly but the gun pointed at Aria getting hit caused his arm to quickly knock into Aria. With his quick reflexes, to save himself, he rotates his left wrist and grabs hold of Aria's forearm to keep her from swinging Needle. He also springs forward and grabs hold of her own throat. Both grips are from a medium-sized man but they feel as if a man twice Black's size is behind them. "HOW'S THIS FOR A TIP?" The smile turns wicked. Just as the shots ring out, Raven moves back forward and raises Faire Taire to Tanner. In that moment, Gelb lunges for the gun and practically throws himself against Raven so Raven's back slams against the nearby window, cracking the glass and igniting a struggle between the two with the most combat experience in the room. ...The teamwork of the three thieves is not one to be underestimated by a few kids, though. Not when they do it for a living and have done so longer than the three of us.It's as if each of the three had their full attention on their targets and the battle at the same time. The three men were like brothers to each other, and just as in-sync as triplets would be. It was scary how much trust they had in each other and how easily they could read fog of war like it's clear skies. Tanner has Genesis pinned; "Don't make a decision you'll regret, boy!" Black is killing Aria; "Hmhmhmhmhm..."
Gelb has his back to Raven and his arms around Faire Taire's barrel handguard. Raven lets go of the carbine. He lets Gelb have his best defense against a threat like them. What Gelb turns around to is someone who has reached the combined point of hatred and despair...and found aggression without bounds. Raven grabs Bravoure and removes it from his sheath. Tanner, once more reading the conflict like a book, turns his back on Genesis to aid Gelb. The bottom of the handle connects with Gelb's right cheek and he starts to fall back. In that instant, Raven lets go of Bravoure and grabs Faire Taire. Quite a predicament everyone has gotten to, never would Genesis expect this counter offensive from them, they live up to their value of capture. Just as when he was about to shoot tanner, a small mistake happened. At the same time when he was about to shoot to disarm the gun flew up and ended up disarmed himself. He was hit on the lower part of his arm and by the shoulder. Though he did knocked off Black’s gun and his hesitation was surely a window of opportunity, it backfired to an unexpected turn of events. As stated before the next instance will decide everything, will this be the result of this small episode down on the streets? He let his guard down just because he was assured that Genesis was disarmed but even without his right arm. Genesis was still standing after he was shot and so grabbed a mug full of hot coffee, took a sip and when Tanner turned back to him, expected that Genesis would splash hot searing coffee on his eyes, yes it was still hot and was probably served before they came in. There was no way Genesis even with the help of his talents aid him in getting out of that counter defensive fix, he’ll have to move it on his own but the blondie sure needed help. True that he failed to see Tanner’s shots coming in, that was genesis’s flaw. To secure an open chance to aid everyone he has to take one of them down for the count, he cannot help anyone knowing he needs to focus on his task for everyone has their own opponent, Tanner failed to see this. “If I’m not mistaken you were looking at my sister the wrong way… I just wanted to resolve that.” He has no time to help Blondie, he has to settle things with Tanner as fast as he can and at the very least capture these trio of crooks alive. Tanner shouts at the top of his lunges and drops his submachine gun as the nearly boiling-hot liquid splashes on his back side. Before he even knows it, he is then punched in the stomach and has all of the wind knocked out of him. He begins to suffocate with his limbo of coughing and shouting and is left on the floor, in the remnants of that liquid, completely incapacitated by the smartly-put together combo. Raven lifts the carbine to his shoulder and points it at Black. An electrical surge fires itself from Raven's brain to his central nervous system. It travels in an instant down his spine, through all the nerves in his arm, to his hand, and into his right index finger. The 7.62mm round fires out of the silenced barrel and through the air, then into Black's side. Time speeds back up to normal and is accompanied by a 130 decibel-pop of the silenced gunshot. A half-second after the shot, Black's facial expression screamed at me in his anguish but he failed to start going down fast enough. So I squeezed the trigger two more, quick times. One of them pierced his left lung and went straight into his heart and he died right where he stood. Right in front of Tanner..and Gelb...his two only friends. Black lets go of Aria and falls to the floor on his belly with a thud. His chains rattling as they touched the floor. The scene seems to pause for a bit as everyone stares at the body. It stays like that a moment as if Tanner and Gelb were praying that their friend would cough and turn himself over but...the only movement from him was the pool of blood that started to seep from the dead man's torso. Gelb watches his friend fall in disbelief. It was he that let his opponent retrieve his weapon and kill Black-to him; He was the one on the floor, instead of Raven; it was all his fault! The man's eyes widen and shivers run down his spine after Black's body lands front-down on the shop's floor. A little longer and the man's lungs relinquish the air inside of him as the violet-red liquid starts to roll out from under Damion's body. There is now nothing left for him here. Gelb threw himself from the floor and quickly made his way to the front exit, grabbing Tanner by the collar on the way and pulling his single, remaining friend out with him. After the two men leave, it takes Raven a full three seconds before he starts to slowly lower his weapon from its lifeless target but the student huntsman cannot seem to remove his gaze from the body. Faire Taire lowers until his arms reach their limit to holding it. Then his left hand lets go and the deadly weapon falls to Raven's side with his right arm. Aria's time in Black's grip was rather brief, but to her, it felt like more than an eternity. She struggled against the grip, but the criminal was strong, much stronger than she was currently. His painful grip on her arm caused her to drop her sword, and she reflexively dropped the sheath to try and pull his fingers off of her throat. Before she knew what was going on, her feet were dangling under, trying to reach for the ground. H-He's really gonna kill me! she thought as everything started to go dark, tears and saliva were dripping down her face as Black started to strangle the last bit of life out of the girl. please...not like this... was all that she could think as her arms dropped to her sides. the feeling of gravity at all but vanished in her mind, she couldn't even tell if she was alive or dead anymore. Though after a moment, she felt the sensation of something hit her back, something solid, it was hard to tell exactly. Aria opened one eye after she felt her back hit something. She didn't really get why she was still conscious either... am I dead? she wondered, as the blurry image of the cafe began to come into view again. "ugh...wha?" From what she could see, she was lying limp on the ground, the sensation she was feeling being simply the floor against her back. The thought of already being dead made sense at first...but that didn't explain her throat still burning from being strangled. It took a few moments before she realized that the pressure around her throat was now gone, she then immediately started breathing again. Aria still felt like she was in a dream, everything was blurry and hard to make out, but at the very least she was somewhat sure that she wasn't dead anymore. She sat up and tried to get a better view of what was going on. The only thing that she could somewhat see, was Black, laying motionless in front of her. She looked down at her legs to see some of Black's blood pooling out and touching her shoes, then looked over at Raven, who seemed to have an expression that she didn't know how to describe.....fierce...could have been a word for it I suppose, terrified could have been another, Two sides of a coin, but both of them were heads. "are you....okay, mister?" she asked in a small tone, the pain in her throat not allowing her to voice herself well at the moment. Asking him if he was going to be alright seemed like a silly thing to do after she got some more air flow going to her brain...after all, it was clear that he was the one who saved her life...but Raven still looked like he was in pain for some reason. Not a thought enters the boy's head. All that leaves are those few words. His instincts do not even tell him to help the girl he just saved. With a flick of his wrist, Faire Taire's stock starts to shift around to cover the barrel, initiating its transformation back to travel mode. The bayonet shifts to half size and slides in while the trigger covers fold back over the guard and the transformation is finished. However, instead of fixing the carbine back to its spot on the back of his thigh, Raven lets the weapon slip from his hand and drop to the floor. His left arm lifts to his chin and he pulls the violet bandanna from his face. Finally, the shock subsides enough for thought. I don't know why but my memory sent be back to my cousin during training and the way he put it when he showed a way to put someone down. He never had to do so himself but I found myself uttering the way he put it. What is the feeling you get...when you take a life...from another poor soul? I felt as if I stepped outside the boundary...I took from that poor fellow something that is not anyone's to take...Regardless of it being just or purposeful, nobody should ever have to do such a thing to another person...Killing..I tell you-killing is not a natural thing for a human to do. There may be times when it has to be done but...when we are all born, it is not nature's intention for us to die by another's hand. After taking a shaky breath, Raven starts to walk over to Aria and pick her up in his shivering arms. He then sets her in a nearby chair to rest. He then plops down in another chair at the small table and does something unusual for him to do outside of his dorm at Beacon, even without the main reason currently on him. He pulls the two velcro straps on Bravoure's sheath and lets it fall on the table. Raven then brushes his left hand halfway through his hair and then rests it there with his head resting on the hand. His elbow against the table. "What is my family going to say? What is my mother going to say? What is the headmaster going to say?..." They were all people I couldn't of even thrown a guess at what they were going to say. My family are all warriors and some even bare the black warrior's jacket, signifying a prime hunter of the blood of men. Naturally they would be supportive of me in an event like this. My grandfather actually commended me for my actions in protection of others with my deeds that day, which made me feel better, but not good. My mother had an...interesting reaction. When I got home, she had nothing to say-nothing to do except walk up to me, reach up, and give me a kiss on the cheek-something she hasn't done since I was a child. She was not angry or proud...she was worried about me and glad that I was okay...that I made it back home..I guess I had exactly proven that I wasn't a failure as a warrior, in comparison to my other family members, but showed her I wasn't worthless. Now, Professor Ozpin...*sigh~*...he made sure that the school not change for me because of what happened. He gave no praise for my 'heroism', like my family did, or express too much worry for my well-being...Instead, he acknowledged my combat reliability and said it was a huntsman quality. I still appreciate his tact in that situation and I'd like to repay him for that but I've never gotten the chance yet. But, when I'm more of an experienced huntsman, I plan on going back to maybe act as a class speaker or...well something. I really owe him for not making the incident a big deal. For not making it escalate past the rumors around campus. Tanner was on the ground under the mercy of Genesis who smiled at him while having a flaming background that spells a nightmare that was about to come, he was that upset about the way Tanner looked at Éclair or so he thinks he did. It wouldn’t seem like he would move anytime soon so he grabbed Tanner’s weapon. It only had a bullet left and it would be perfect to practice his shooting skills for once, he knew what he had to do and aimed it at Black’s wrist and as soon as he turned around to point at his target, the shot was fired. It wasn’t from him but from his carbine, he failed to capture Black alive instead he brought about his own demise, the shooter shown signs of hesitation, signs of restraint. It was his fault, if he came to aria right now and stopped Black, he wouldn’t have not died but then he cannot risk being shot from behind by tanner or rather have tanner shoot anyone in this matter, to what price? A life for a life. Genesis turned to Aria and Raven as Raven set her down on a chair, he grabbed a free cup of warm water from the dispenser and served it to him. “Have a warm cup of water my friend, you earned it and you did what you have to do. Know this; I understand why you have to.” At that time he wasn’t enrolled as a student, Genesis was just a mercenary no more or no less than that. From Raven’s expression its evident he can feel remorse and it seems his sense of morality is present but somewhat conscious of what people would think of him. He bares quite a resemblance to Genesis back then when he first had to kill on his first mission with his father, when he did, he felt no shame for he was scarred and had died years ago. It seems those old memories of being a refugee had come back to him. “I’m Genesis, Genesis Pendragon nice to see a fellow Hunter.” It wasn’t natural for him to go out revealing his name to strangers he just met but there was something more about Raven than meets the eye. Aria's face seemed to brighten up when she heard Genesis say that he and Raven were both hunters. "I guess that explains a lot...you guys can really fight." Aria was going to sanctum at the time, working in the cafe that they were in to make some extra cash, the owner of the store was reluctant at first, but she proved to be a capable employee. Though dealing with problems on her own was what she was used to, it's what she strove to do to prove that she was capable of making it on her own, but this time was different. Without the two in front of her, she wouldn't be sitting where she was now. So Aria swallowed her wounded pride and looked up at the two. "Thank you.....for helping me, with those guys, I was really in a bad spot there, so.....yeah, thank you again." Her words were mumbled a bit, but they were loud enough to hear if one was listening. Aria didn't like asking people for help, so thanking them for it was just as awkward for her. Raven lowers his hand and takes the glass before downing it. A little trickle of water drips out of the sides. He sets the cup down and sighs. "Thanks...Genesis.." His voice is soft-spoken. Raven just releases a short hum in response to the girl's thanks and nods. 'Hm'...that's all I said to the girl. Just a 'hm.' It was the work of all three of us that routed Black's gang and Genesis and I had worked together to make sure Aria lived to tell her own side of the tale. Heroism-wise, I felt the same as I did before and still do. I just did what someone with a weapon would probably do while Genesis stood up to a man with a gun while he had an injured arm but, judging from his reaction, he probably did that more often that the rest of us so I doubt he felt much different. I was a changed man when it came to my morals, though. Did I know that back then? I don't even know. It felt different but-...I don't know. A few more minutes and the police would be there and everything would feel better...That's what I was thinking. "I'm sorry you-...you had to-..." Words could not express Raven's feelings well enough. He wanted to apologize to Aria for having to witness today's event but he could not find the language appropriate enough for it. She smiled kindly as he responded to her thanks, but the shock of what had just happened was still settling with Raven. The girl glanced over at the man that had died right in front of her, her knees were still trembling a bit from it all, but she was trying to pretend that it didn't bother her at all. The truth was that seeing Black's body in such a state bothered her greatly. Seeing that much blood coming out of a person, seeing their body twitch as it desperately clings to life...she felt sorry for black, if only in the fact that she can relate to what those last few moments feel like before he died. all you feel is fear, and pain....draining the life out of you until there is nothing left but darkness. Aria was refusing to allow these feelings to take hold of her on the surface, but even with her efforts, she still couldn't keep her knees from shaking. Aria let out a long sigh as she heard Raven attempt to apologize to her, hearing it made her smile just slightly, regardless of the dark tone in the room. It was just a little ironic, that he was trying to apologize...even though it was her fault he was in so much pain. "It's bad karma to say your sorry for saving a girl's life y'know." she tried to keep her soft smile on her face as she looked at Raven. "Though, just cause you saved my life.....doesn't mean you get to act however you like! You made a decision, so stand by it. It may have been out of desperation or cause you were scared, but you made it." The young girl crossed her arms in an angry huff, with her bright green eyes glaring daggers at Raven. "So don't mope around so casually, it's frustrating to look at you when you look like you regret saving me." She nodded in approval of her own words, but was probably doing a poor job of achieving her overall goal of trying to pull Raven out of his shock, from a certain perspective though, her words were more of a scolding rather than something that might bring comfort. Raven finds it impossible to smile but the girl's odd way of cheering him up seems to lighten his heart a bit. "I-..I suppose you're right..." But he still does not know how to feel.